New documentary exposes the horror of life in Saudi Arabia. Five bodies hang from a pole suspended between two cranes, a public display which serves as a reminder to those who might contemplate a life of crime. They belonged to a gang of five robbers, all of whom were publicly beheaded before their corpses were hoisted high in the air, where they remained for days. The gruesome sight is one scene in a shocking documentary to be aired this week which sheds light on life in Saudi Arabia, one of the world’s bloodiest and most secretive countries. 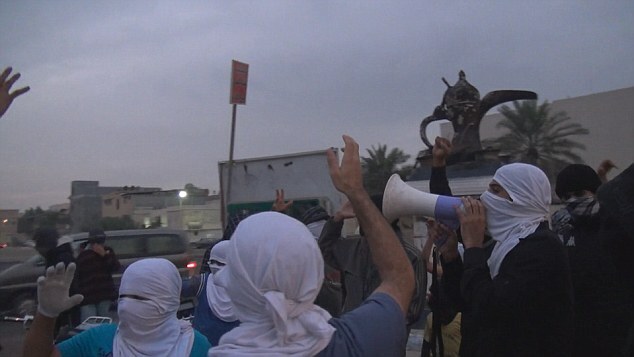 The film, Saudi Arabia Uncovered, contains harrowing footage of beheadings. 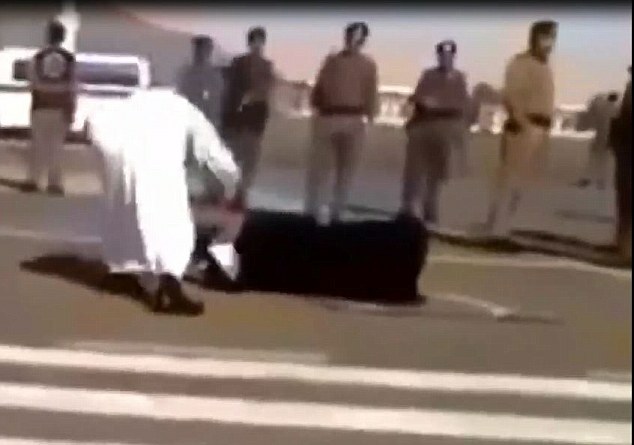 A woman dressed in black is held down at the side of a public road by four Saudi policemen, after she has been convicted of killing her stepdaughter. We have all heard of the brutality of the Saudi regime, but what makes this documentary so chilling is that we see it on camera. 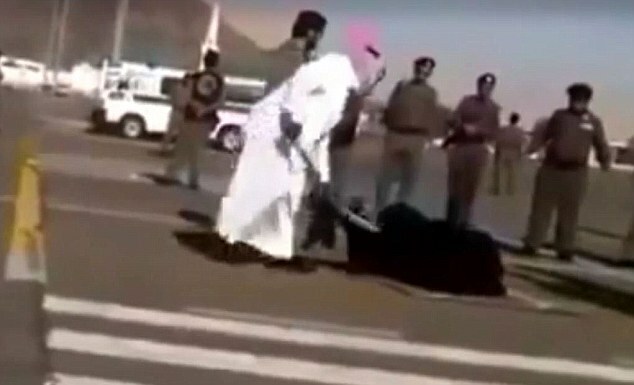 In another beheading scene, the executioner, dressed in the white robes typically worn by Saudi men, raises his curved sword above his head and brings it down in a single sweep. 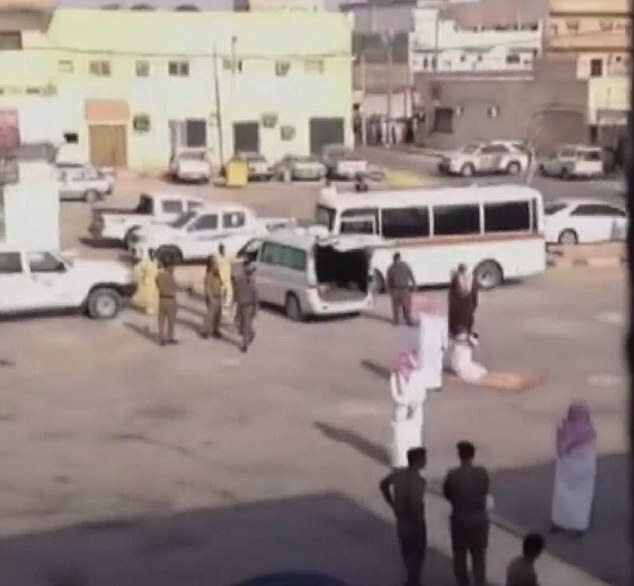 The documentary introduces viewers to a large public space nicknamed Chop Chop Square because it is the site of so many executions in the Saudi capital, Riyadh. The camera lingers on the red-stained drainage system used to wash away the blood of those executed. Police are seen brandishing whips against women, who are considered second-class citizens. At one point they brutally knock a woman to the ground and you hear her scream. 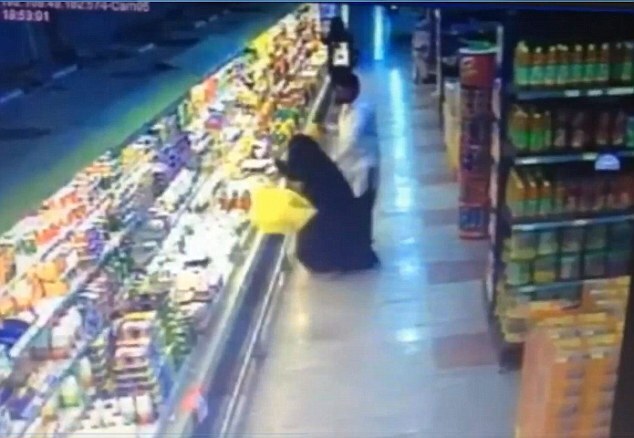 In a similar vein, a male supermarket customer pushes a female shopper to the floor for no apparent reason. He then walks past her, oblivious to her anguish, as she scurries terrified out of his way. Yet Saudi Arabia remains one of Britain’s closest allies, not just in the Middle East but worldwide, as it has for nearly a century. We sell them arms. They sell us oil. The royal families of each country are close. Prince Charles has made numerous trips to the kingdom and, when King Abdullah died last year, flags at Westminster flew at half-mast in a highly unusual tribute to a foreign ruler. Our leaders conveniently overlook the truth about the desert kingdom. In Saudi Arabia, even a minor criticism of the regime can result in a lashing or long prison sentence. Beheadings, the film makes clear, are commonplace — so far this year, the country has been executing its people at the rate of almost one a day. Ferocious moral codes are enforced by the religious police as they patrol the streets and shopping malls. Blasphemy is punishable by stoning or execution, theft by amputation. Anyone found guilty of insulting Islam faces ten years in prison or perhaps 1,000 lashes. The outside world is kept in ignorance of most of this because it is impossible for foreign journalists to report from or film in Saudi Arabia without minders. Indeed, it is difficult to get into the country even as a tourist. Only because of the extraordinary bravery of the film’s makers, and Saudi democracy activists who helped them, is the truth now being aired. This is the same broadcasting combination which caused a storm of international controversy when, nearly 36 years ago, it screened Death Of A Princess, the story of a Saudi princess and her lover who were executed for adultery. 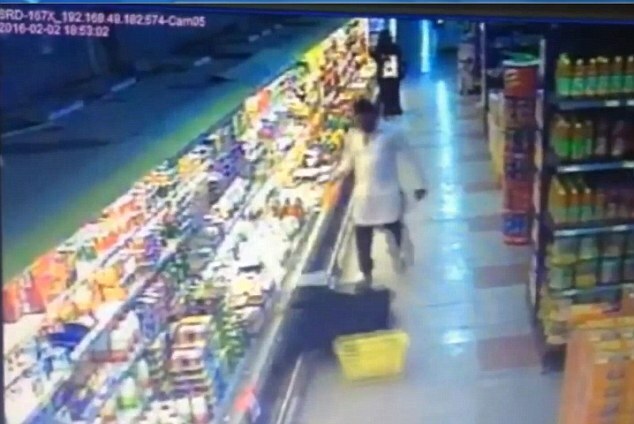 In the resulting furore, the British ambassador to Saudi Arabia was expelled and trade contracts were broken off. The film was condemned by the Foreign Office because it offended Saudi rulers, and it has never been reshown on British television. Already, similar pressure is being brought to bear over this new documentary. Saudi activist Loujain al-Hathloul, who campaigns for women’s rights in a country where women are not even allowed to drive — and who was jailed and treated as a terrorist after posting an online video of herself driving a car — has received death threats after taking part in the film. It is easy to see why such an exposé might be greeted with horror by the Saudi establishment. But schoolchildren are not just taught to direct hatred at Christians and Jews. They are also instructed to turn on Shia Muslims, a substantial minority in Saudi Arabia. The film includes rare footage of desperate Shia in the east of Saudi Arabia bravely protesting against their oppression. It illustrates how one young protester, Ali Nimr, was arrested at the age of 17 and sentenced to be beheaded, with his headless body displayed publicly for two days for his role in the protests. The British Government says it has received assurances that he will not now be killed, but Saudi media reports last week suggested he could be executed imminently. Ali’s uncle, Sheikh Nimr, a controversial Shia cleric, was executed on January 2 this year, along with 46 other men, in Saudi Arabia’s largest execution since 1980. The British Government is well aware of all the brutality meted out in Saudi Arabia. Here is what the UK embassy in Riyadh says in its information pack for British prisoners in the desert kingdom: ‘The Saudi courts impose a number of severe physical punishments. Anyone who protests against the Saudi regime faces harrowing punishments. One blogger, Raif Badawi, was convicted of insulting Islam after making public comments about his government and Islam. For comments like this, Badawi, a father of three whose family now live in exile, was sentenced to 1,000 lashes and ten years in jail. The religious police even ban the playing of music in public. The film contains disturbing footage of them smashing a lute which was being played on a beach. The police ruthlessly enforce their militant version of Islam, known as Wahhabism. There is footage of these state-sponsored fanatics forcing women to cover themselves, complaining about them wearing make-up and herding people out of cafes to pray. The official title of the religious police is the Committee for the Promotion of Virtue and the Prevention of Vice. Chillingly, only two other movements in the world — the Taliban in Afghanistan and Islamic State in Syria and Iraq — have organisations with the same name. The Saudi government has always denied that it has any connection either with Islamic State or with Al Qaeda. Nevertheless, both jihadist organisations endorse the state religion which Saudi Arabia has spent an estimated $70 billion (£48 billion) exporting around the world. Saudi Arabia denies any link to terrorism, and is indeed preparing to send troops to fight Islamic State in Syria. But this film examines evidence to suggest that there were links between the Saudis and Al Qaeda in the period before the attack on the Twin Towers on 9/11. It is well known that 15 of the 19 Al Qaeda-inspired 9/11 hijackers were Saudi citizens. However, there have always been suggestions that the links ran much deeper, and the film offers compelling evidence that this might indeed be the case. This is a documentary that exposes the deep hypocrisy of Saudi Arabia’s relationship with Britain and the West. Britain is determined to maintain this relationship even though the country it deals with is, by any definition, barbaric. The film even shows how the fearsome Saudi police — who fire bullets at unarmed protesters and activists simply for expressing an opinion contrary to the state’s — are trained by the British Government’s College of Policing. Our nation’s friendship with Saudi Arabia means collaborating with a regime that persecutes its own citizens with a savagery that defies imagination. Some might argue that this domestic brutality is a matter for Saudi Arabia alone. When he was asked recently to justify our relationship with the Saudis, David Cameron replied that the country’s intelligence services have provided vital information exposing terror plots aimed at Britain. Yet this argument is undermined by the undoubted fact that Saudi Arabia exports its murderous jihadi ideology around the world. On the basis of this deeply disturbing film, it is time to reassess Britain’s connection with the kingdom of Saudi Arabia. Previous Previous post: Study suggests Americans are changing their diets for the better but not fast enough. Next Next post: Iraq bombing in Baghdad death toll rises to 250.